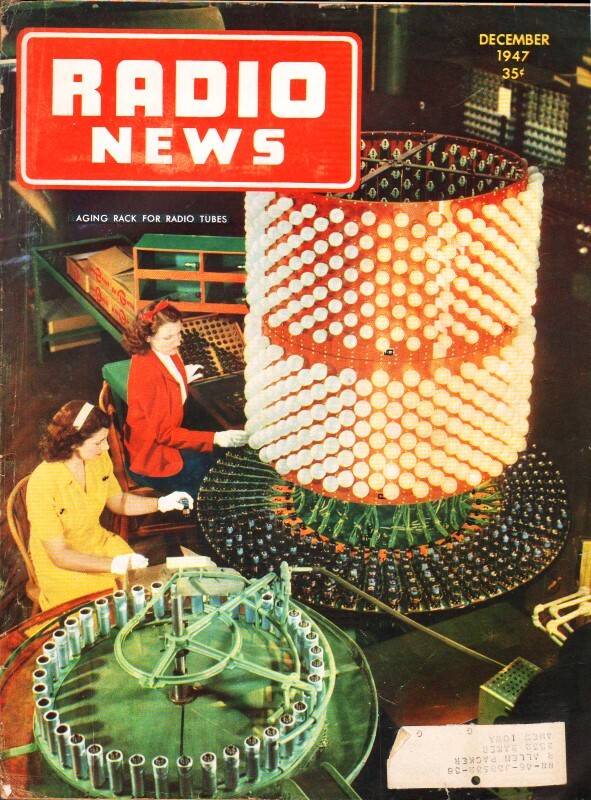 [Table of Contents] These articles are scanned and OCRed from old editions of the Radio & Television News magazine. Here is a list of the Radio & Television News articles I have already posted. All copyrights are hereby acknowledged. "If you have dark eyes and blonde hair. and are under 30, you're due for some easy squeezing. Milligan's Appliance Center, 84 Main Street, is giving every girl between 16 and 30 who has these striking features a newly patented orange squeezer, to introduce the new item ... Note: Any traces of recent peroxide rinse will disqualify applicants." 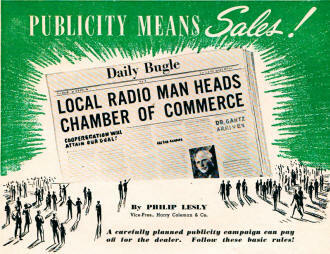 That is advertising copy offered as an example effective promotional material in a 1947 edition of Radio News. My first reaction was to think how something like that would never fly today, but then I wasn't so sure. It seems there must be anti-discrimination laws in this 'offend nobody' climate today that prohibits singling out a certain demographic for inclusion or exclusion; however, there are many such promotions run today such as members only, active military and student discounts, senior citizens, etc. Maybe only privileged sectors of society are still allowed to discriminate. Vice-Pres. Harry Coleman & Co.
A carefully planned publicity campaign can pay off for the dealer. Follow these basic rules! Modern merchandising involves many factors - getting salable merchandise, proper pricing, attractive store fronts, effective display, good salesmanship, advertising - and the reputation of the dealer. This one point, the most intangible of all, can make all the others ineffective if it is neglected, or can bring surprising returns if it is developed expertly. Your reputation among your prospective customers depends on two things - the way you do business, and how much the public knows about you and your business. They go together and cannot be separated. If your business methods are basically unsound, no amount of publicity will set them right. If you don't let the public know about you, it will take a long time for your sound policies to payoff in sales. 1. Be fair to all customers. Play no favorites. Set a price on every item and offer that same price to everyone. 2. Be scrupulously honest. Be sure every customer knows exactly what he's paying for and gets a receipt for every purchase. 3. Provide liberal guarantees. Exchange merchandise without question if the customer is dissatisfied. 4. Offer as much service as you can afford - pickup and delivery, installations, free check-ups and estimates. 5. Remember the little extra things that please the customer-prompt delivery, etc. What very few dealers understand is the effectiveness of publicity in letting their prospects know what they have to offer, and in building up the name of the store to the point where it attracts customers. This familiarity of a name influences everybody's daily purchases of products: Coca Cola, Ivory soap, Pepsodent toothpaste and hundreds of other items. It also frequently determines the choice of store where these items and others are bought. Such places as Macy's and Marshall Field's sell more of the standard-priced, nationally advertised items than their competitors because their very names attract customers for everything they sell. You as a dealer have two ways of attracting prospects. One is by offering "X" brand of product, which has been advertised and publicized so that many buyers will seek it out or react favorably when they find it. You, by carrying this brand, automatically gain the benefits of the manufacturer's publicity. The other way is by making your own store the attraction; so that the prospect will say, "Let's get our radio at Milligan's" and then come to you to see what you have to offer. The ideal combination of the well-publicized product and the well-publicized store is what makes the cash register jingle. With this in mind, and once you have firmly established the requirements of a good reputation, it will pay to begin a systematic campaign to make your store's name familiar and well-regarded. 1. Make the familiarizing of your store's name your primary objective. Before you do anything along the publicity line, be sure it will help reach this goal. 2. Simplify the path to the objective. Many of your opportunities for newspaper stories, radio mentions, and word-of-mouth comments will come from your personal activities. These won't help build up your store very much unless your name immediately brings to mind the name of the store. For this reason, it is wise to have your name a part of the store's name; "Milligan's Appliance Center" is better than "Ideal Appliance Center." It will be a long, slow process to get most of your prospects to the point where they know that the "Ideal Appliance Center" is run by the Mr. Milligan they read about in the papers. "Stewart Milligan, local radio merchant, yesterday walked off with the gold cup at the annual Elks Club golf meet ... " If the reader has seen a sign saying, "Milligan's Appliance Center," the reference to your being a radio merchant rings a bell. Otherwise, the name "Milligan" means nothing to him and this sort of publicity is lost. The same thing is true along every type of personal publicity. Get full benefit from it, if you can, by associating your name with the name of your store. 3. Select your audience carefully on every story you plan to send to newspapers or radio. You have a rather definite buying area that includes the great majority of your prospects. In a small town, it may mean the whole town and rural areas for thirty miles around; in a big city, it might be only one square mile. You must concentrate your efforts in your sales area if they are going to payoff. Suppose your store is located in Elgin, Illinois. The Chicago Daily News may be read by 30% of your prospects, while the Elgin paper is read by 90%. Even though the Chicago paper's total circulation is twenty times that of the local paper, the latter is likely to do you more good. So, if you must choose where to send a story about yourself or your business (as in the case of a feature-type story that only one paper will use) you'd be wiser to place it in Elgin. Mere volume of circulation does not necessarily mean effectiveness. In most respects, the publicity handling will be the same for the dealer in a small town as for one in a big city. The first has his local newspapers, either small dailies or weeklies, while the second is likely to have a community newspaper or two which serve the people in his own buying area. In almost all respects, these community newspapers are edited and prepared in the same way as small town papers, and will use publicity from a dealer in the same way. For the dealer in a medium sized city, which is not large enough to have community newspapers but is too large to have newspapers with a community tone, the acquisition of space for the dealer's publicity is likely to be more difficult. It must compete with a broader scope of other material-world and national news, as well as a greater area of local sources. In this case, the news value of the dealer's releases must be especially high, and the material prepared with greater care to make it rate space in the papers. A story that appears will reach not only the dealer's buying area but other sections which ordinarily would be considered out of his zone. Such publicity can very greatly expand the area from which he draws his sales. There are other factors that will determine your selection of an audience. One publication may reach a large group of low-income families, while another reaches a smaller group of high-income families. In all probability, the audience you reach in the second publication will provide more sales and larger ones. Home owners usually are better prospects than apartment dwellers, women generally make more decisions on radios and appliances than men, and so on. Keep these points in mind in planning publicity. 5. Always remember that the foundation of the reputation you are trying to build is fair play. Ballyhoo alone, not based on a sound business policy, builds up a name to the point where, when unsound practices cause trouble, they are played up in the press and in conversation beyond normal proportions because of the prominence of the person involved. Select from your business practices some special feature, develop a slogan or identifying phrase, such as "You're sure of satisfaction at Milligan's" or "We're as near as your phone," and use this in your advertising. Then let it be a theme - not used - but implied whenever appropriate, in your news releases. 6. Good publicity springs from activity. Doing things makes news. For personal publicity that will reflect to the advantage of your store, join local civic groups, instigate plans for local improvement, talk before business groups, work with news-making committees, be active in church and social organizations. For business publicity, do things that are different; offer a free orange squeezer to every dark-eyed, blonde woman in the circulation area of the newspaper in which you place the story; give a bottle-warmer free to every veteran of World War II upon the birth of his first child. These things not only will attract attention to you through regular publicity channels, but they'll make real friends of the people who receive the free item. 7. Develop a sense for news. If you should employ a one-armed veteran to sell refrigerators, there is a real human-interest in the fact he can demonstrate how to remove ice cubes - and it will show how easy the refrigerator's trays are to handle. Many events and plans that come up normally can be developed into news. if you'll cultivate the sixth sense of watching for them. 8. Coordinate your publicity with your advertising. This doesn't mean that you should try to get the editor to run a story every time you place an ad. Many editors resent this, and as a general rule the larger the paper the more dangerous this practice becomes. Instead, plan your advertising to take advantage of stories appearing in the papers. If you run a unique sale, for instance, get the stories into the papers, then come out with your ads. Also establish a theme for your store's policy, perhaps based on the slogans mentioned earlier, and use this theme in both publicity and advertising. 9. 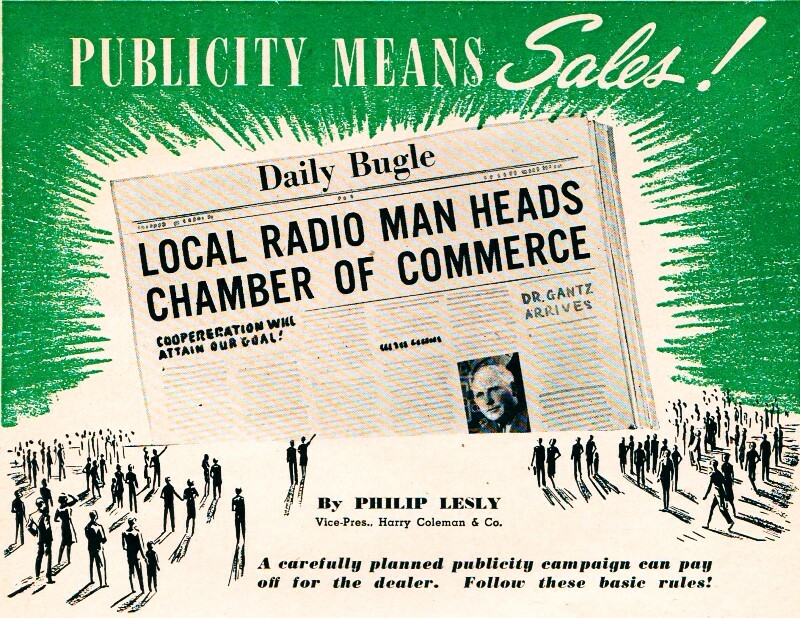 Know how to handle the mechanics of publicity. The method of preparing a publicity release is shown in Fig. 1. When the story covers more than one page, end each sheet with the end of a paragraph, and then mark "(more)" at the bottom of each page except the last. 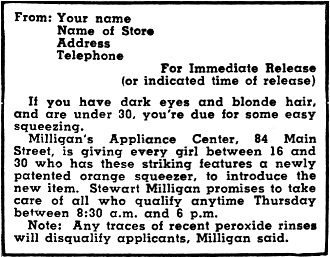 "All girls between 16 and 30 who have blonde hair and dark eyes will receive a newly patented orange squeezer free Thursday at Milligan's Appliance Center, 84 Main Street. The offer is made to introduce the new device, according to Stewart Milligan." Except when the story must not appear before a certain time for a legitimate reason, mark the story "For Immediate Release," thus permitting the editor to use it whenever he wishes. Pictures accompanying your story should be on 8 by 10 inch glossy paper. Of course, they should be clear and sharp and have as much reader-interest as it is possible to put into them A picture of a beautiful girl examining a new refrigerator is far more likely to be used than a picture of the refrigerator alone. Each picture must have a caption, written on a separate piece of paper and attached to the edge of the picture in such a way that it can be removed easily without damaging either the caption or the photograph. Be sure the caption contains all essential information, including the addresses of persons shown. Before using a picture for publicity or advertising, get a signed note from everyone who appears in the picture, granting permission for such use. This will avoid serious legal embarrassment. Address the story and/or picture to the editor who is most likely to use it - city editor, women's editor, financial editor, etc. If it is convenient, have the story delivered to the newspaper office. Otherwise mail it, being careful to protect pictures from damage. Except in the special instances already mentioned, send the same story to all outlets. In the case of pictures, however, when more than one pose or idea is available, send a different picture to each paper. When each paper gets a different picture, mark each "This Picture Exclusive" so the editor will know his competitors will not carry the same one. Publicity is not a competitor to advertising - it is a supplement. Everything you send out as publicity must have real news value to the publication that receives it, or it will not be used. Make every story and every picture as close to the highest journalistic standard as possible. The chief requirements for a highly effective publicity program are imagination, alertness, and a little effort. When well done, it can bring surprisingly great returns over a long period. Add it to your bag of merchandising tricks.